The Macallan is nowadays one of the most iconic whiskies distilleries in the world with such high demand for its precious whiskies that they are sold out no mind what the price is. Read this interview with the head and nose behind these inspiring whiskies. 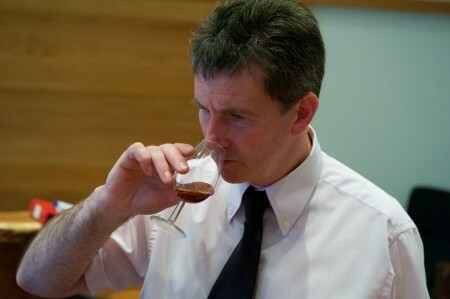 Bob Dalgarno,Whisky Maker at The Macallan distillery since 1996. He was born to the trade, at Glenallachie Distillery not far away, where his father worked, and started at Macallan in 1984 as a warehouseman. After passing through every stage of whisky making mashman, brewer, stillman, warehouse supervisor, operations manager he joined the panel which selects casks for bottling in 1994. How long have you worked as master distiller at The Macallan? Bob Dalgarno, I have been Whisky Maker for The Macallan since 2000. From 1996 to 1999 I worked alongside the previous whisky maker. I have worked at The Macallan distillery since 1984, firstly in warehousing, then in production. Working as part of a team, my role is to nose mainly mature whisky samples from casks in our warehouses, building knowledge of stock profile. From that knowledge the whiskies are created. Are there any specific Master distillers that have inspired you? In which way? I wouldn’t say other Master Distillers have inspired me, but I have the greatest respect for them, not only for what they do, but the people they are. Right now The Macallan ages whisky in three kind of casks: sherry, bourbon and new oak. Is there any “exotic” experiment taking place right now? There are always ideas being looked at in the Sample Room. How is Macallan doing in this period of global crisis? In challenging times, we continue to meet those challenges. Many distilleries are creating right now younger, ageless expressions along as special or limited releases. Are we going to see something like this from The Macallan in the coming months? Working on feedback from consumers, our commercial team then report back on their findings. We created a strength-driven no age statement range in the 1824 Collection exclusively for Duty Free in the past. This allows greater freedom in the creation of products, rather than restricting us by age. With this range the make-up of the whiskies are older rather than younger. The whiskies used required time to mature, in order to showcase the colour and depth of character seen. Which one of the whiskies that you do at The Macallan are you more proud of? I would like to think that I am proud of all the whiskies we put together. They have their own challenges and stories to tell. I love the Macallan 10 years old Cask Strength. Any chance we see another expressions of Macallan at Cask strength, particularly any of the Fine Oak range? I am delighted that you enjoy this whisky. We are not working on any other cask strength products at present. In Spain, people don’t drink much single malt whisky. They prefer for Johnnie Walker, Cardhu or J&B. They see The Macallan as a luxury item (and it is priced like that here!). Any advice for our Spanish readers? I can understand your Spanish readers’ thoughts on The Macallan. The whiskies you have mentioned, Johnnie Walker and Cardhu are nice whiskies and there to be enjoyed, but everyone should afford themselves a little luxury now and then. What has been the last whisky you have drank? Any favourite? Last whiskies drank – Macallan 15 Year Old Fine Oak and Bruichladdich 20 Year Old.